When you’re lucky enough to have an abundant harvest or to live close enough to farms to take advantage of farmer’s markets, you’ll want to put every last tomato and peach to good use. Preserving the harvest can let you enjoy the fruits of your labor for months to come. There are several methods for preserving your fruits, vegetables, and herbs. Which method you choose will depend on the type of fruit or vegetable you are preserving and your ambition level. The National Center for Home Food Preservation has an excellent, up-to-date website with information on all types of food preservation. Storing is the easiest method for keeping your harvest, but most vegetables don’t have a long shelf life. Root vegetables and vegetables that can be cured, like onions and winter squash, will last the longest. Only store fully mature, healthy vegetables. Any bruised or immature vegetables should be eaten fresh or preserved by other means. Clean of soil and allow the outside of vegetables to dry before freezing. Many vegetables keep well in the freezer. When blanched and frozen soon after harvesting, this can be the best method for retaining nutrients, as well as color, texture, and flavor. Most vegetables can last 8 to 12 weeks in the freezer. Freeze food immediately after packaging. Keep freezer temperature at 0 degrees F. Or lower. You can set your freezer control to -10 degrees F. the day before freezing, to speed the process. Don’t try to pack your freezer with unfrozen produce. This will only lower the temperature in the freezer and lengthen the time needed for the produce to chill. 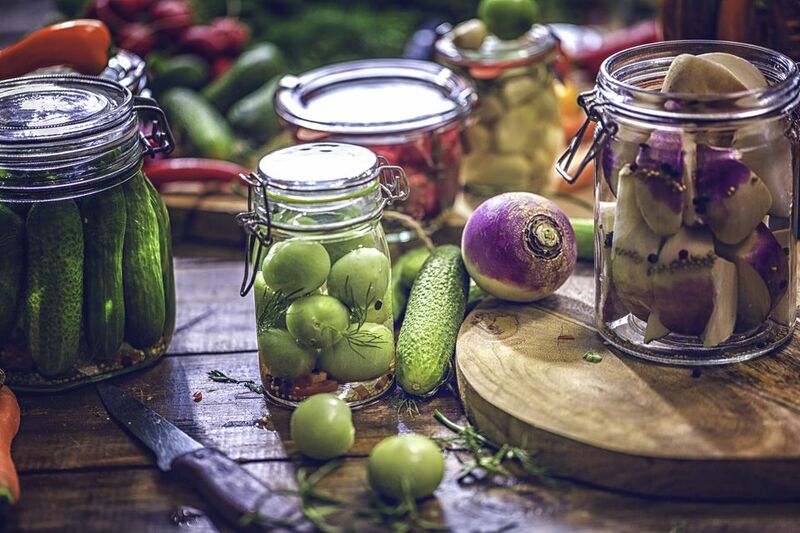 Canning is a great method for preserving fruits and vegetables with a high water content, like tomatoes, mushrooms, beans, and peaches, but it is essential you follow canning guidelines to the letter. Use clean jars and new seal lids. Process in boiling water or a pressure canner for the specified amount of time. Drying fruits, vegetables, and herbs is also a very easy process and can be done without any special equipment or sped up by using the oven or a dehydrator. Dried fruits, seeds, jerky, leather, and even popcorn can be done by these methods. Provide good air circulation while drying, to prevent spoilage. Be sure the fruits and vegetables are fully mature and disease free. Cucumbers come to mind when we think of pickling, but many vegetables and fruits can be preserved in this manner, including peppers, cauliflower, apples, and pears. Relishes are also prepared by pickling. Always follow a tested recipe. Even in vinegar, spoilage can happen. Canning pickled products by the boiling water methods further stop spoilage. Choose only disease-free fruits or vegetables and wash them well before processing. No method of preserving food smells as wonderful as making jams and jellies. The freshest, sweetest fruit makes the best jelly. The acidity level has to be right for the fruits to gel. Lemon juice is added to low acid fruits. Don’t alter sugar amounts in recipes. Sugar helps preserve and gel the fruits.